Will you get on board with Marie Curies Daffodil Campaign? Spring is a time to celebrate new life: when flowers are blooming, the sun is starting to shine, and the cold winter months are fading. However, whatever the season, people become terminally ill and die. Recently we have lost some national treasures at the cruel hands of terminal illness: Alan Rickman and David Bowie. Now, more than ever, we have been shown how terminal illness can affect us all. As our population ages, the number of deaths is on the increase: meaning more people are contracting multiple and ever more complex illnesses. Care is needed not only for those diagnosed, but also the family: the turmoil of terminal illness can be confusing and isolated. This March there is something you can do, to not only help a cause which has the potential to affect us all in one way or another. Marie Curie’s Great Daffodil Appeal, has been raising awareness and funds for those with terminal illnesses since 1986: bringing light in the darkest hours. Running 9 hospices, giving free specialist care, and pouring their efforts into palliative and life care research, Marie Curie are one of the most proactive charities in the UK. Every day matters when you’re living with terminal illness, and Marie Curie works to make the most of every single one. Their specialist nurses have touched the lives of so many sufferers, as well as offering long term support to families who are grieving. They understand that terminal illness does not just affect the diagnosed, but is equally as painful for those surrounding them. From practical to compassionate help, every source of suffering is cared for both during and beyond the final stages of someone’s life. Their work is tangible, delivering results and making a real difference to the lives of thousands of families in the UK. And their work is only set to evolve: changing the conversation about terminal illness to one more positive and less fearful. From the simple donning of a cheery daffodil pin to running a fundraising event, every effort towards the cause is appreciated. The daffodil is a symbol of new life, and a reminder of the joy loved ones past have given us. Perhaps you could spare a couple of hours to sell the pins: get together a group of friends and paint your local area yellow with daffodils! Or maybe you have a little bit more time to spare? From bake sales, to tea mornings, to charity shows, to a challenging sponsored run, the potential is endless! 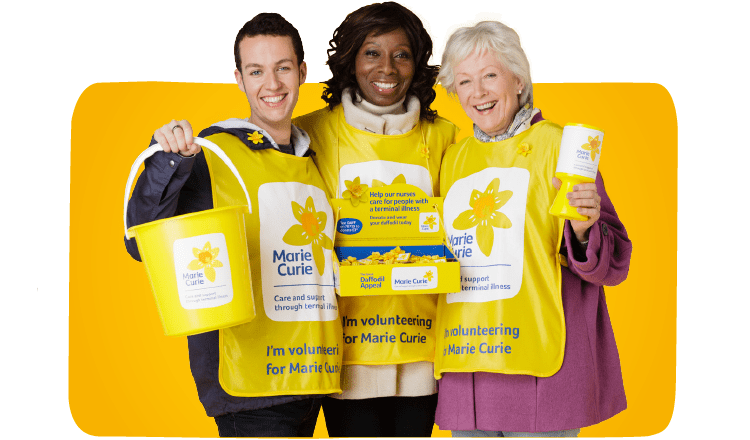 For a free fundraising pack, visit the Marie Curies Daffodil Appeal website, where you can also calculate how far your time will go and what impact you can make. Terminal illness is sadly an issue we cannot avoid, but with your help, Marie Curie can ensure that every sufferer, and their family can have the support and care they need: what better cause to support this spring?